Front entrance of the Officer's Mess building - May 2004. 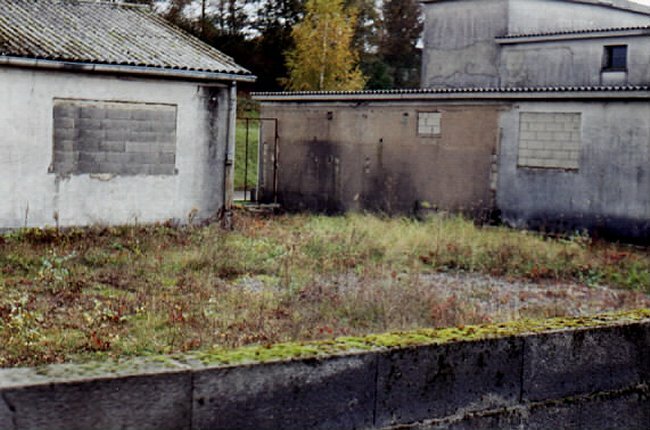 Remains of the Officer's Mess patio - 2000. 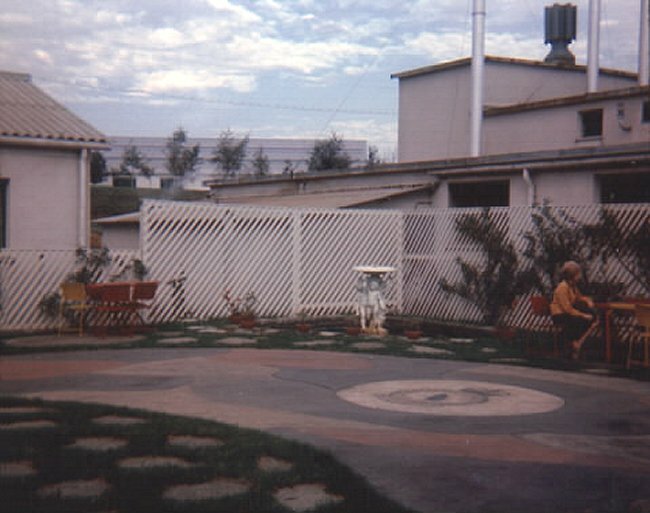 Officer's Mess patio 37 years previous - 1963. 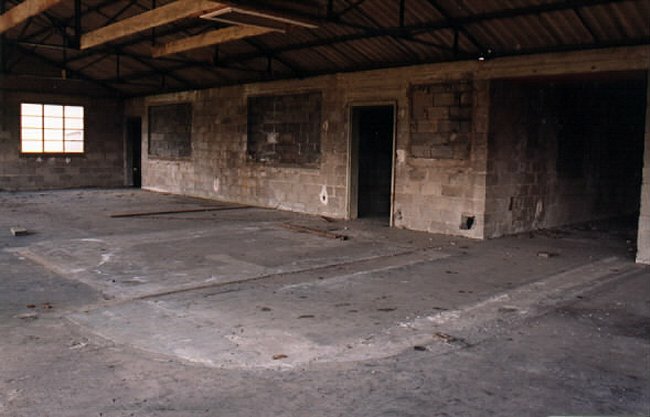 Interior of the Officer's Mess showing floor impressions of the main and the back bars - 2000. 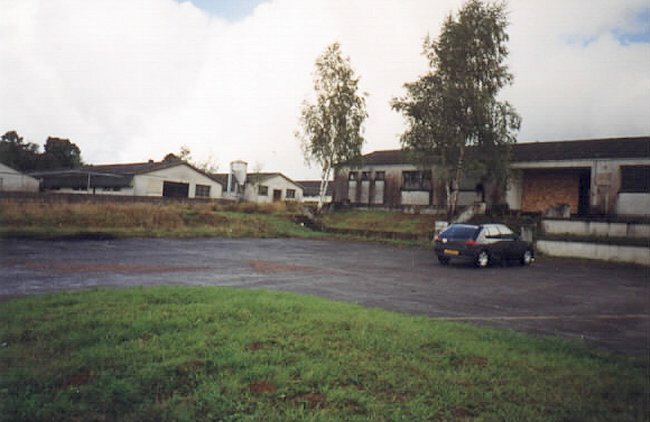 Officer's Mess (right) with 445 Squadron barracks in the background (left) - 2000. 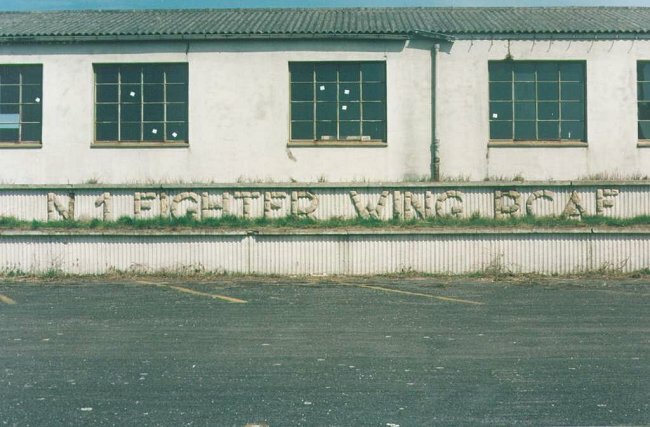 Signage at the Officer's Mess - 2000. 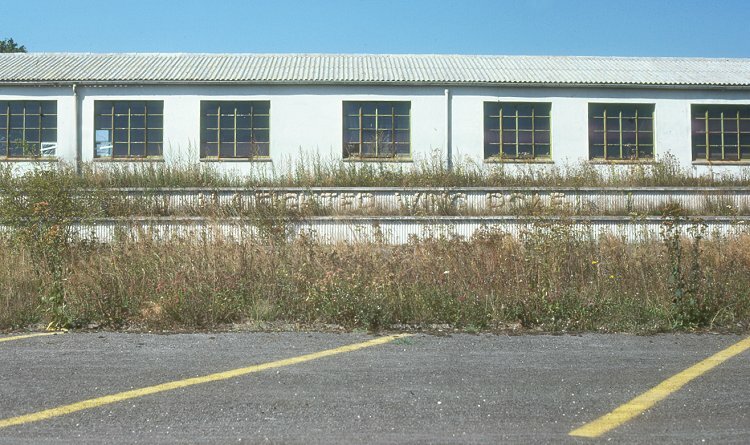 General view of the Officer's Mess building - July 1996. 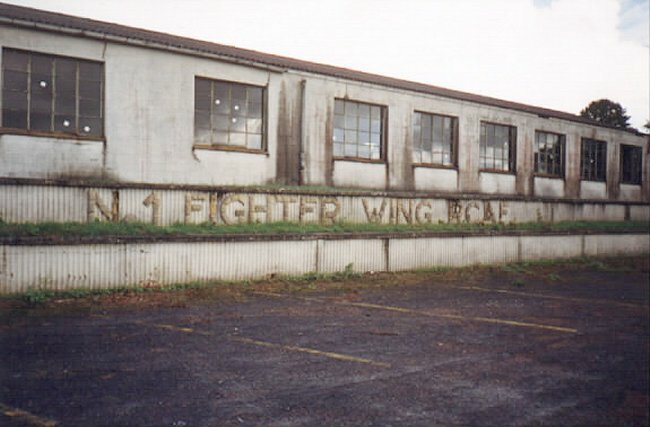 Closer view of the Officer's Mess building - July 1996. 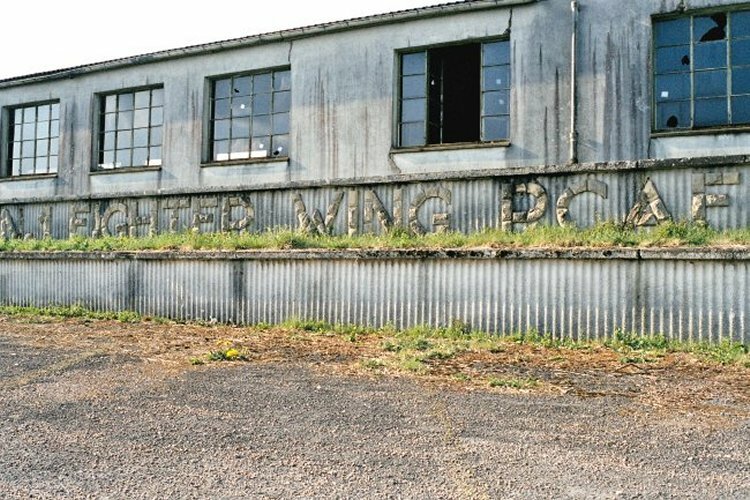 Remains of the Officer's Mess - May 1992. 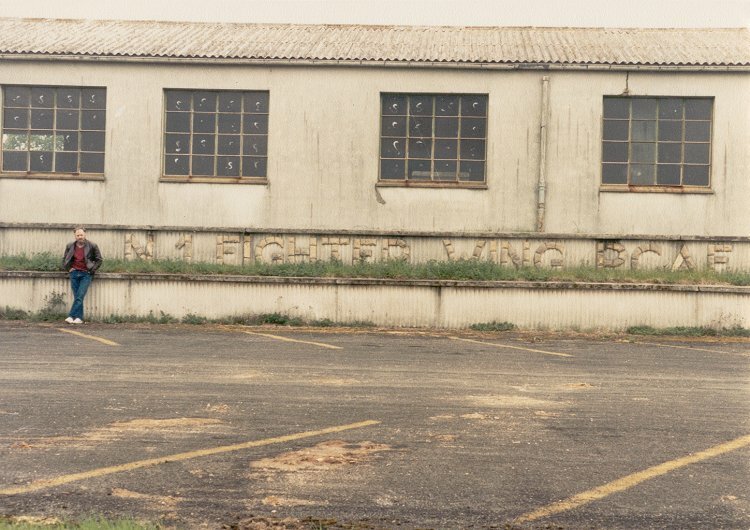 Andy DeGaust standing by the remains of the Officer's Mess - May 1984. 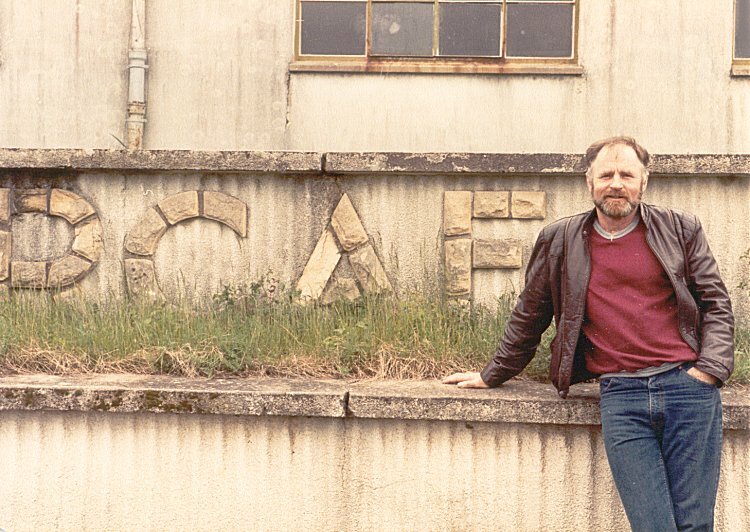 Closer image of Andy DeGaust standing by the Officer's Mess - May 1984. 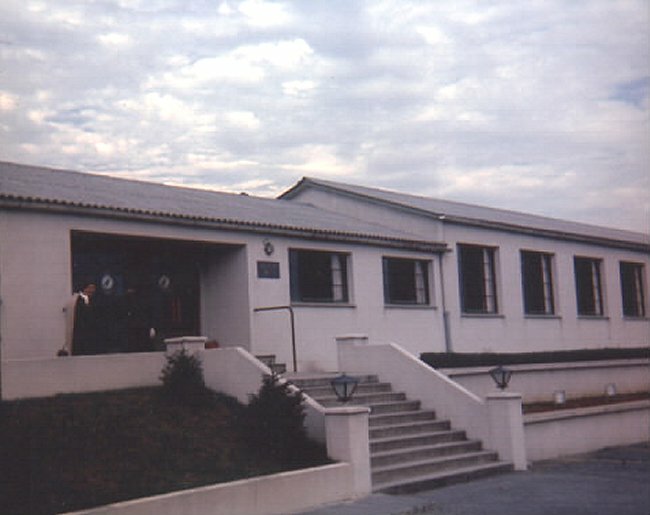 Exterior view of the Officer's Mess - September 1975. 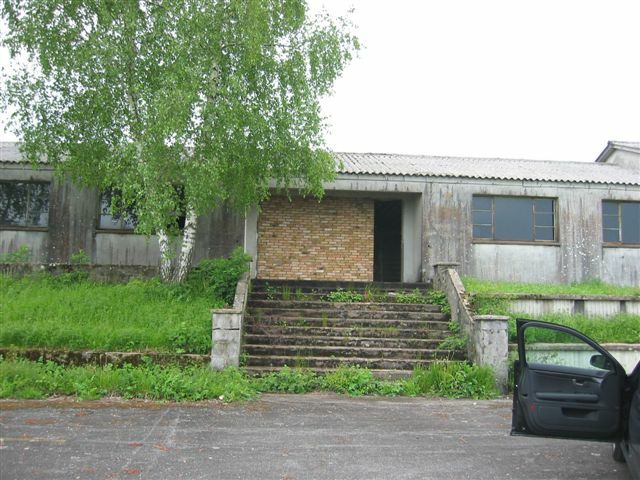 Detail and photographs pertaining to "The Chateau Room". 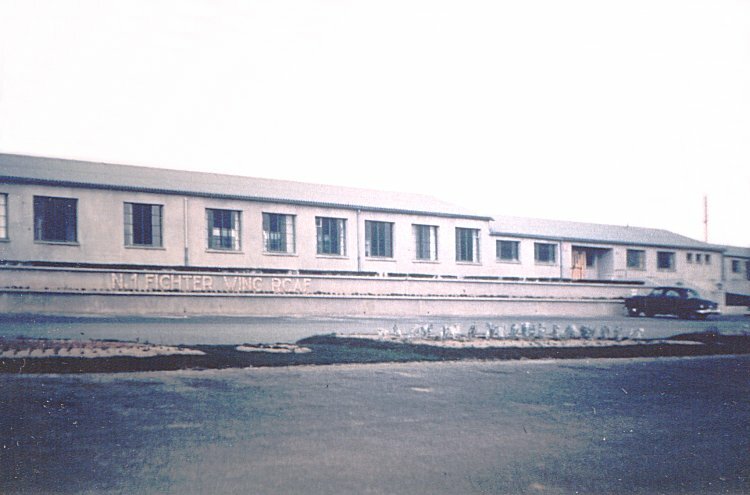 Front view of the Officer's Mess area - 1963. 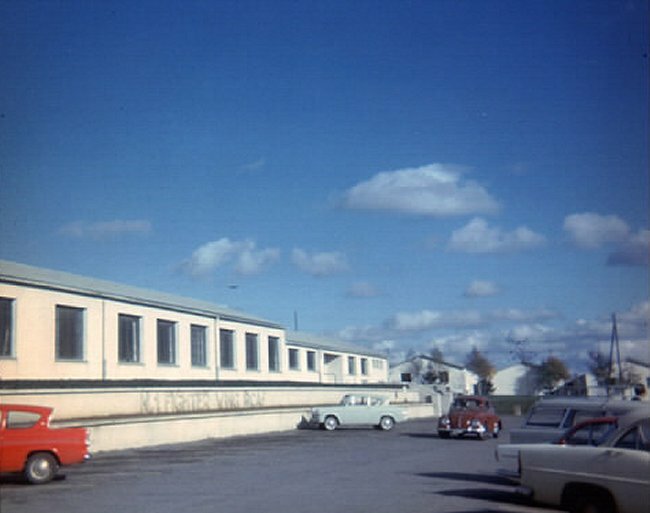 Main entrance into the Officer's Mess - 1963. 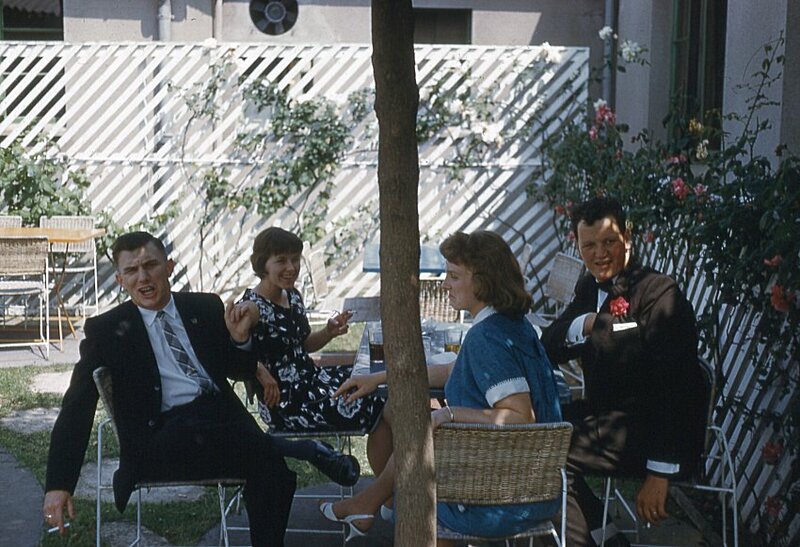 Officer's Mess patio - 1963. 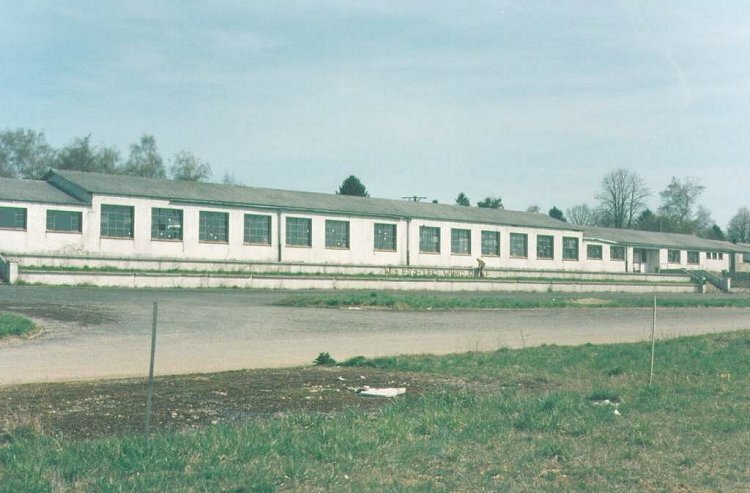 Front view of the Officer's Mess - April 1961. 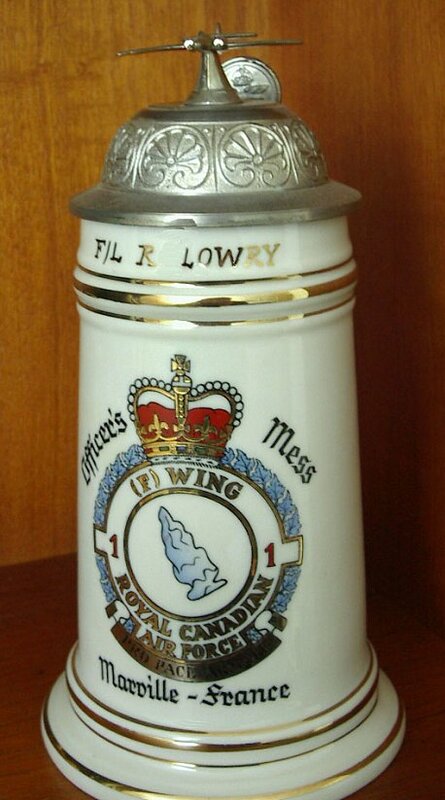 F/L Bob Lowry's Officer's Mess beer stein - 1961. 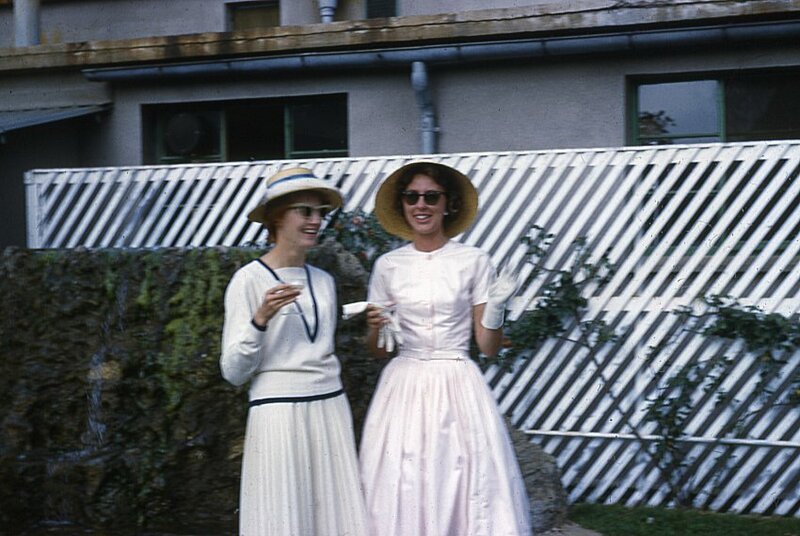 Teachers Helga Goetz (now Zimmerly) and Irene McKinnon - August 1960. 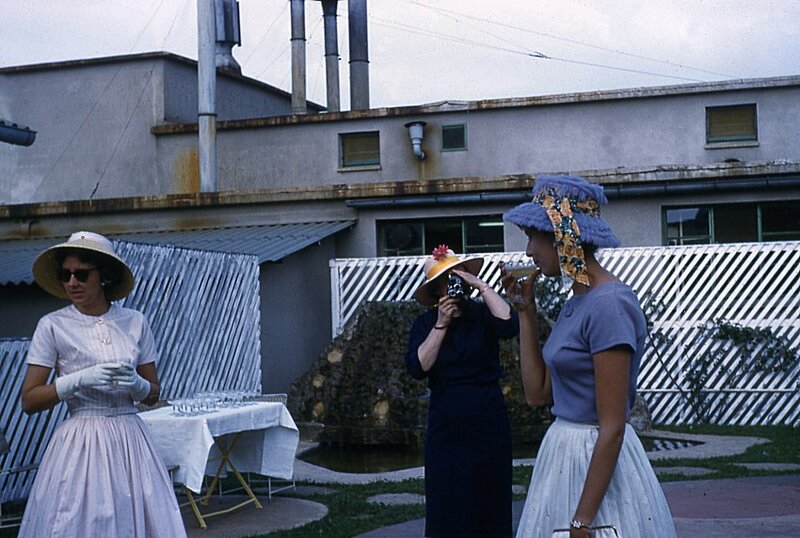 Teachers Irine McKinnon, unknown, Diana Taylor - August 1960. Teacher Marie-Emma Merrifield - August 1960. 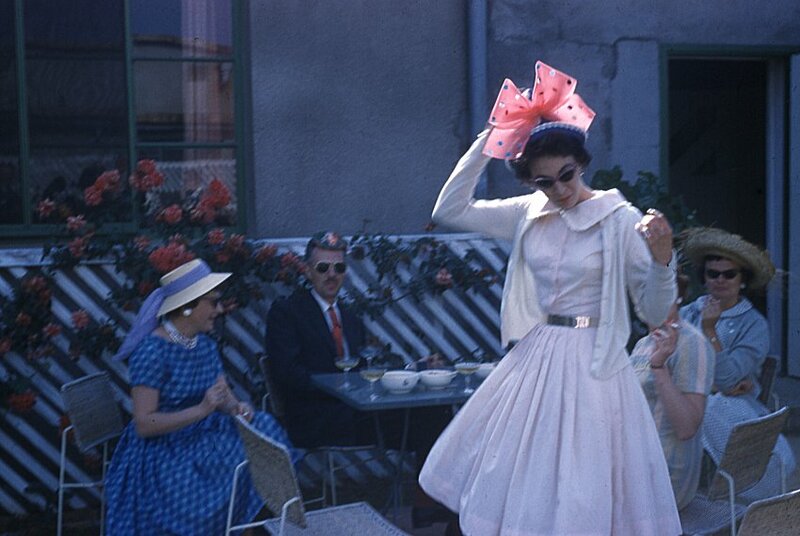 Sybil and W/C Hugh McLachlan - July 1960. 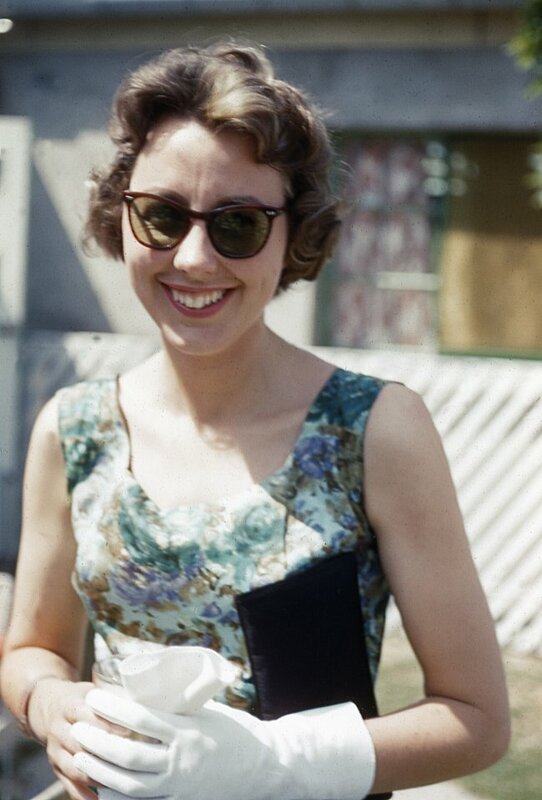 Teacher Irene McKinnon - July 1960. Barry Gartner (441 Squadron), Marg Belfry, Irene McKinnon - July 1960. 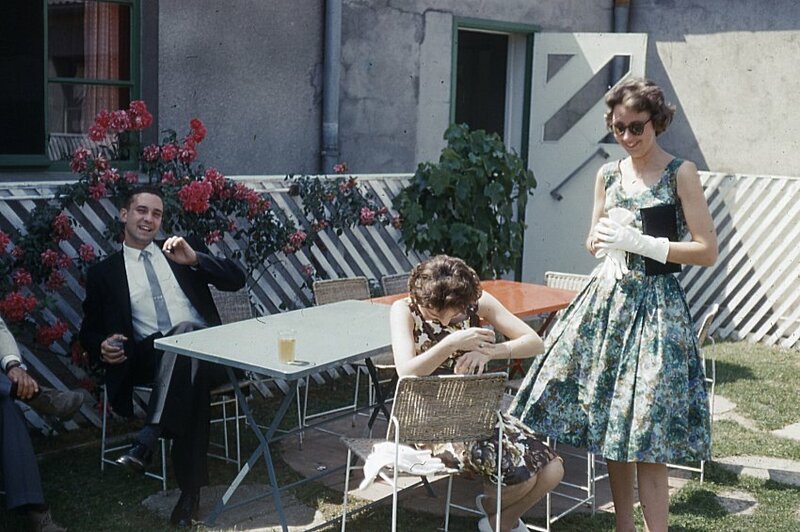 Chuck & Joan Winegarten, Clancy & Vina Sheldrup - June 1960. 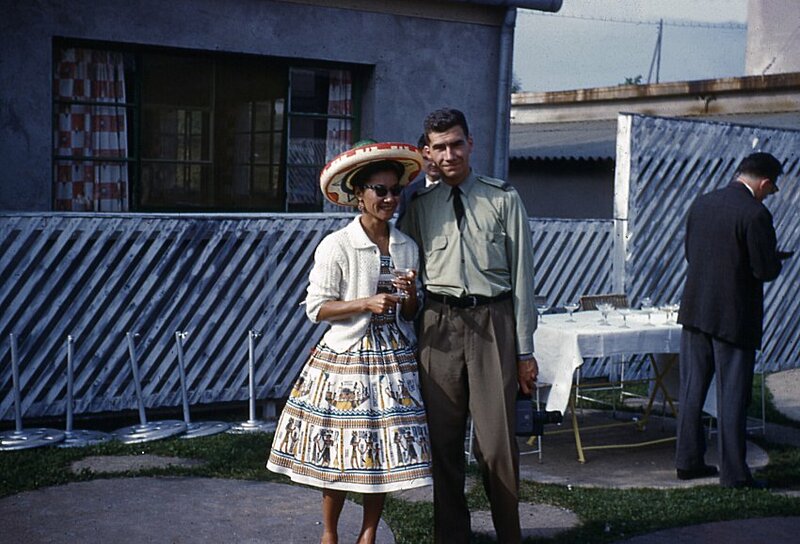 Bob Joli and Aline - June 1960. 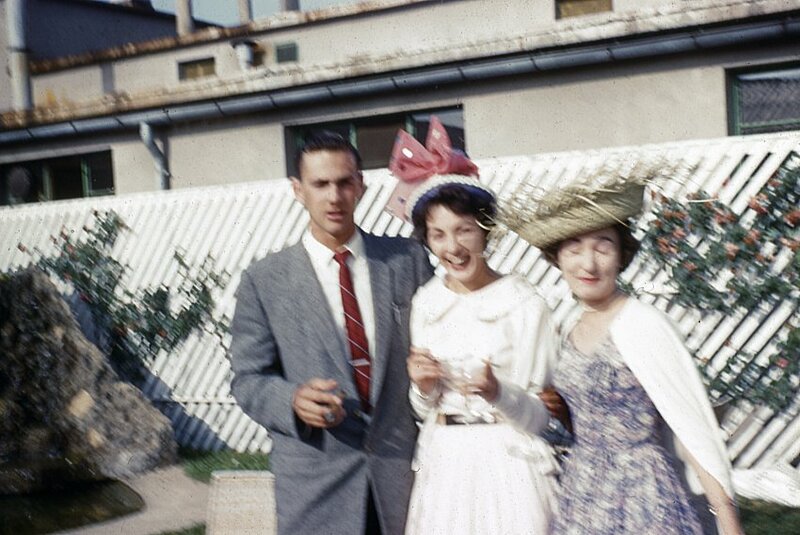 Teachers Lawrence Proulx, Marie-Emma Merrifield, Marg Belfry (now Lynne) - June 1960. 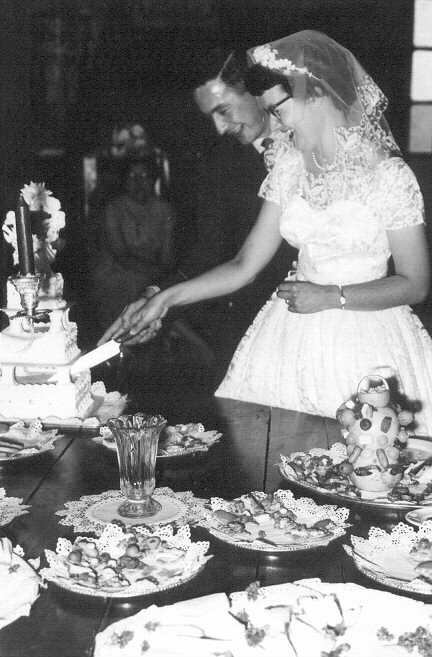 Marg & Dennis Paproski cutting the cake in the Officer's Mess after the religious ceremony - June 1960. 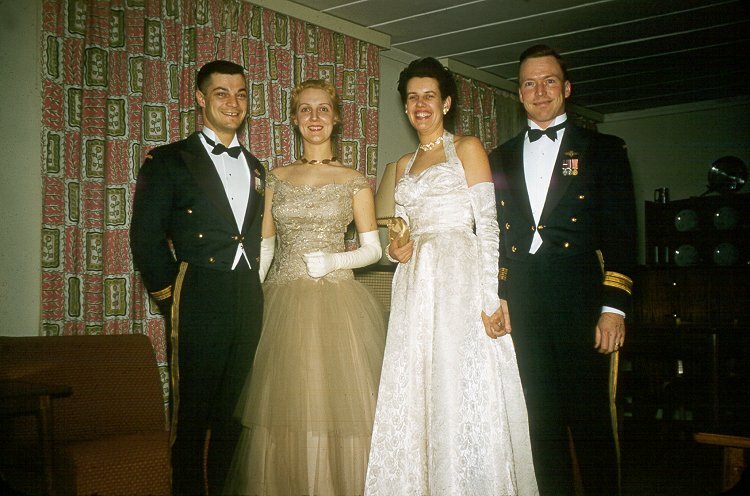 Marg & Dennis Paproski with attendants Ed Yakachuk and Marg Belfry (now Lynn) leaving the Officer's Mess after their wedding - June 1960. 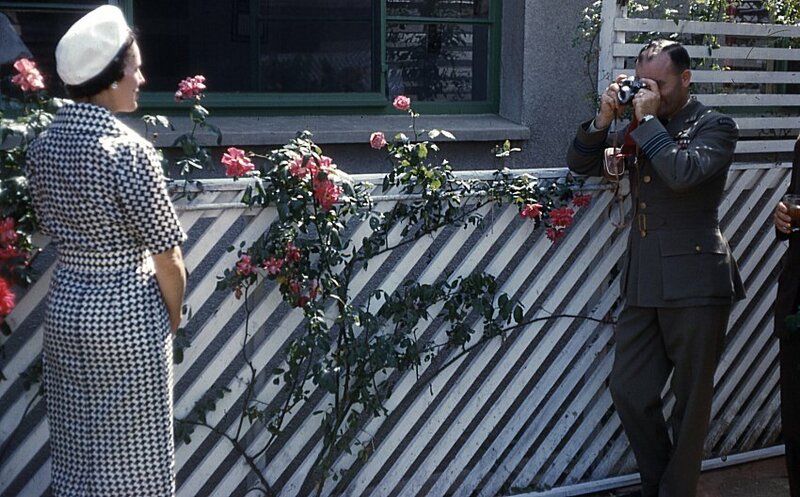 At left is W/C Hugh McLachlan (OC 441 Squadron) and his wife Cybil. In front is Mark Constantine (441 Squadron) who was killed in a Sabre accident at Chatham shortly after returning to Canada. 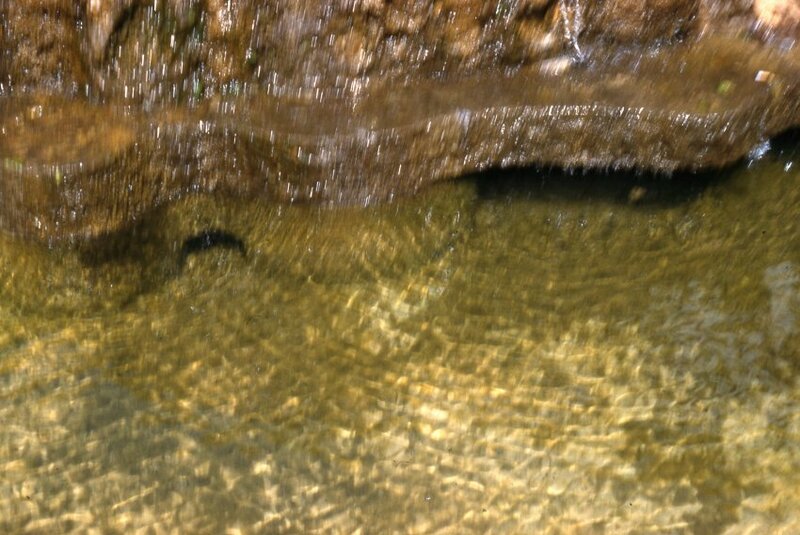 The "fish pond" at the Officers Mess - 1960. 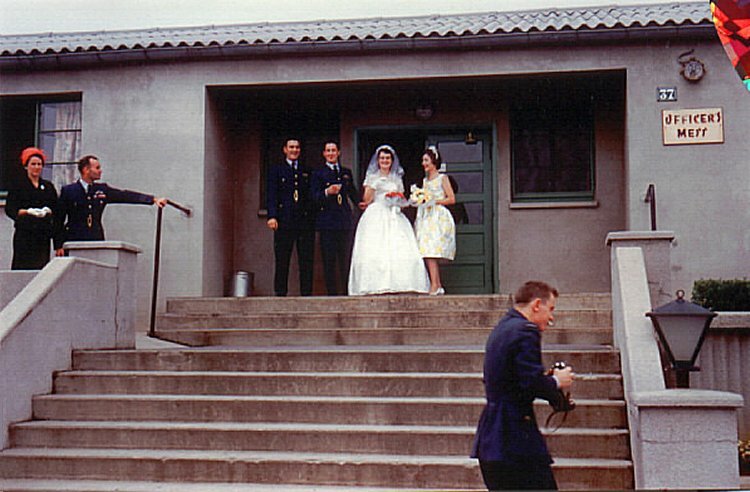 Throwing the wedding bouquet at the Officer's Mess - 3 October 1959. 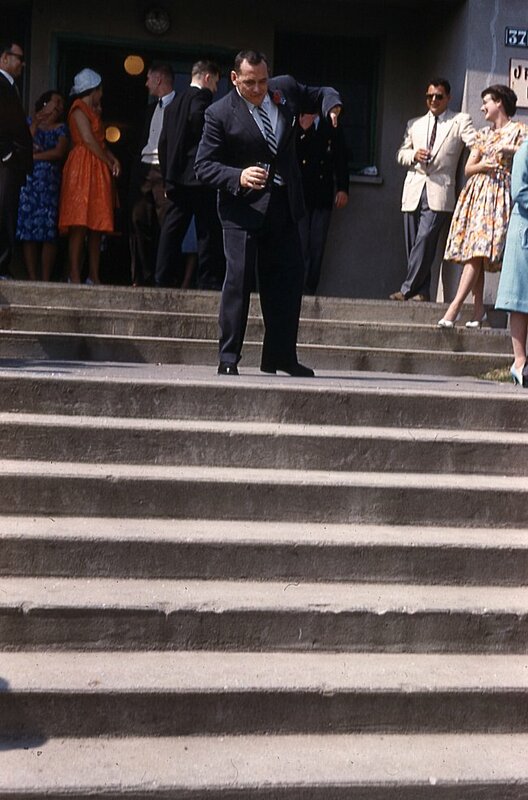 Barry Morris "The Hook" on the stairs of the Officers Mess - 1959. 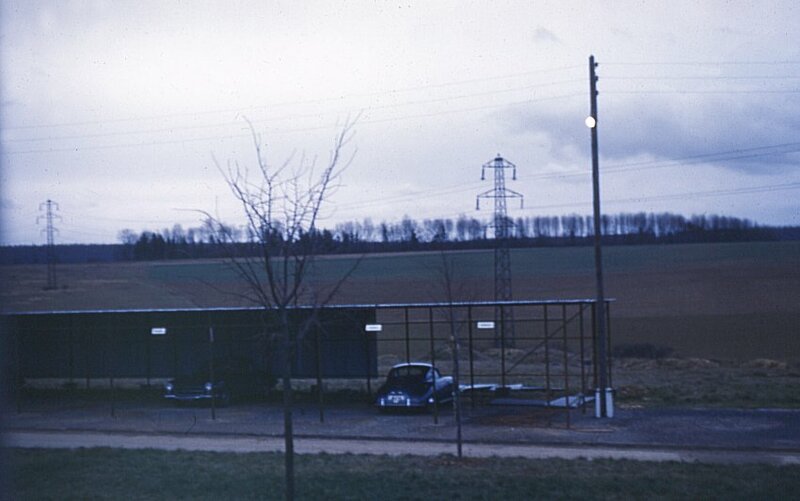 Single Officers parking garage - 1959. Assorted photos of the Officer's Wives Skit - March 1958. 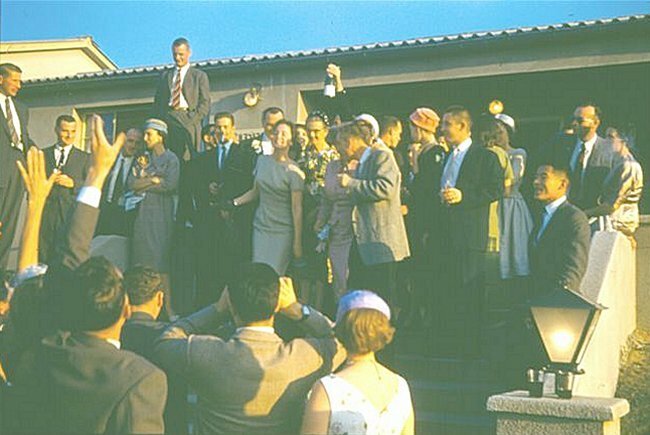 New Year's Eve Ball at the Officer's Mess - 31 December 1957. 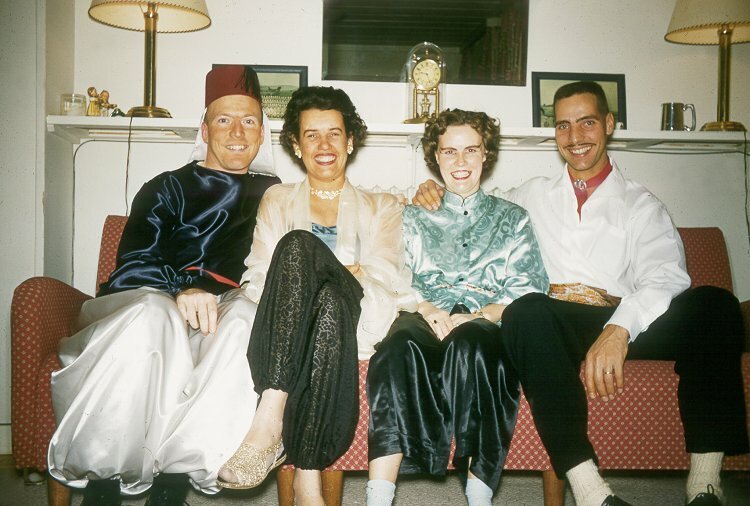 (L-R) - Claude & Lily LaFrance with Marge & Don Laidler. Pre New Year's Eve Ball photo taken in PMQs - 31 December 1957. (L-R) Don & Marj Laidler with Madelon & Robert Laidler. Assorted photos of the Officer's Wives Skit - March 1957. 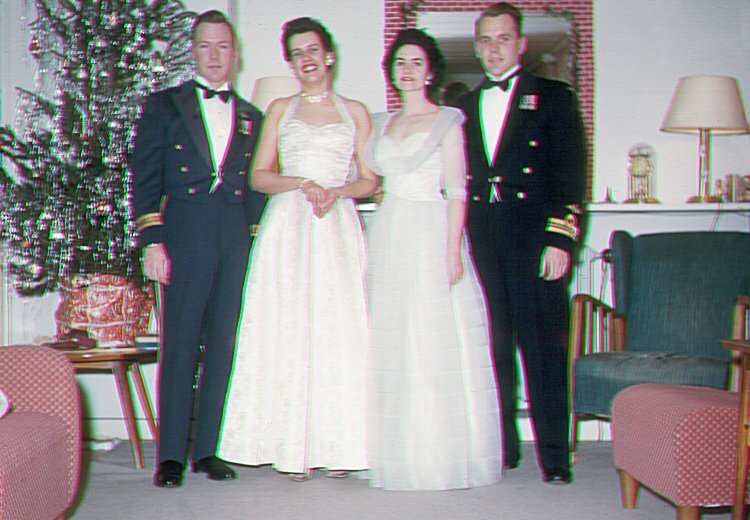 All dressed up for the Halloween party at the Officer's Mess - 31 October 1956. (L-R) - Don & Marj Laidler with Norma & Al Tegart. 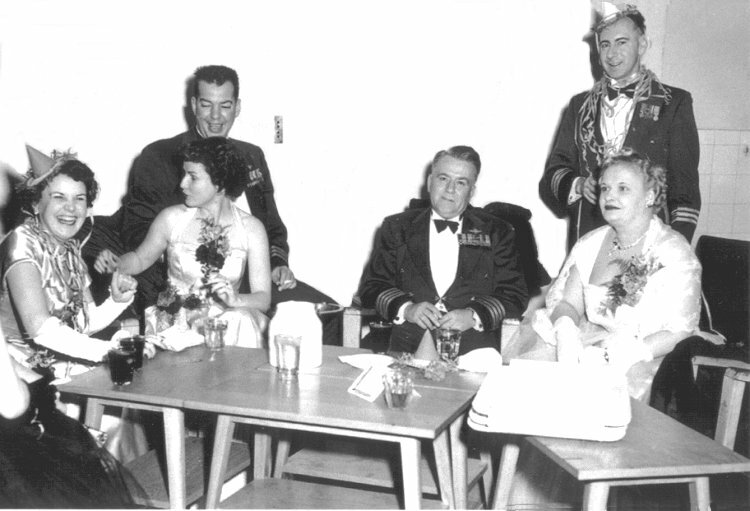 Officers at News Year's Eve function - 31 December 1955. Back row (L-R) Unknown, unknown. Front row (L-R) - Unknown, unknown, G/C Red Sommerville and his wife. Courtesy National Archives of Canada C207988. 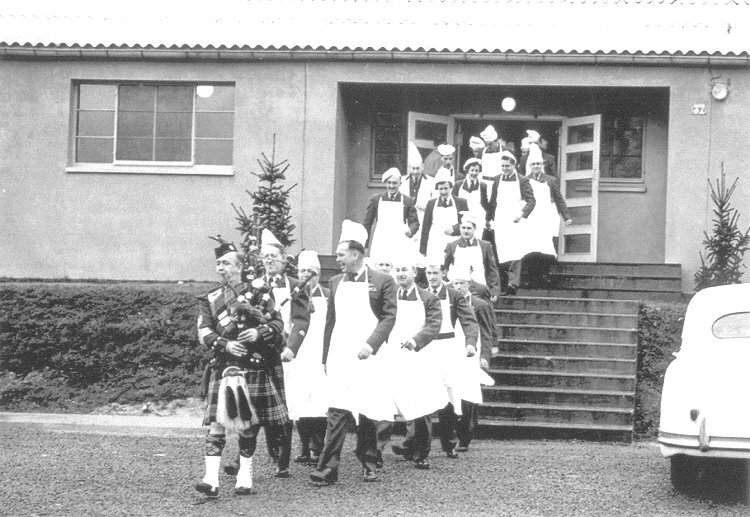 Officers and NCO's march to the Airmen's Mess dinner - 25 December 1955. Courtesy National Archives of Canada C207987.